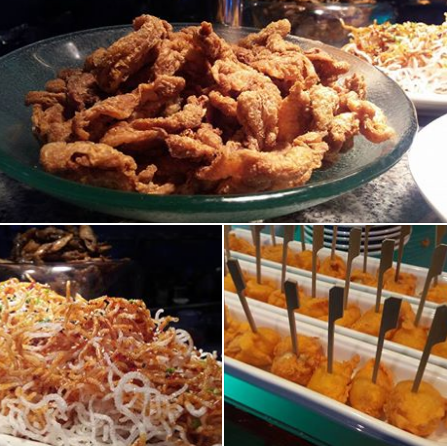 Are you in search of a good location for meetings and meals in Makati? Then Terraz Bistro and Meetings is the best place to go. 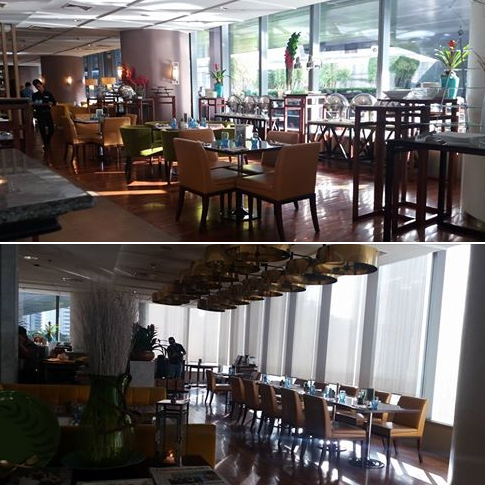 Located at the third floor of the plush Zuellig Building, the elegant restaurant has lovely, spacious dining areas plus private rooms for meetings and corporate lunch outs. Its 117-seater bistro is a perfect set up for social events. There is also an outdoor seating area set among the building's garden for a relaxing al fresco dining experience. 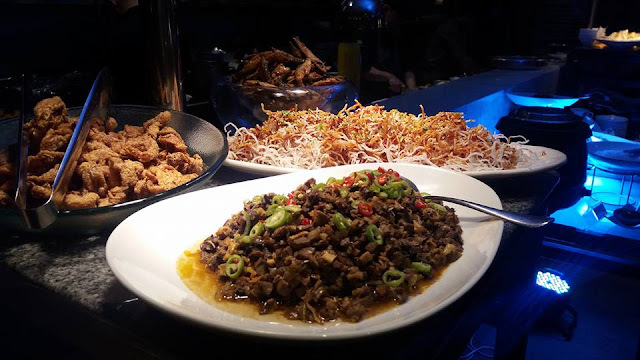 Terraz Bistro offers Filipino, Asian and European Cuisine. Its open kitchen showcases Executive Chef Arnold Gozon and his team's culinary expertise. 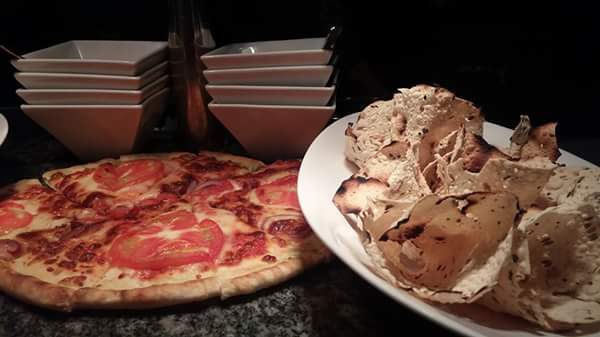 Terraz will take on a culinary journey that evokes familiar tastes and aromas. It is another restaurant under Raintree's roster that crafts well-executed dishes. I came in on the last day of February to try out their dinner buffet. 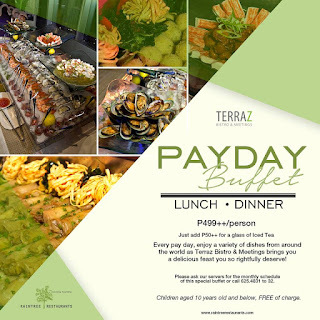 And I was in luck, they actually have a buffet promo for paydays priced at P 499 (exclusive of service charge). 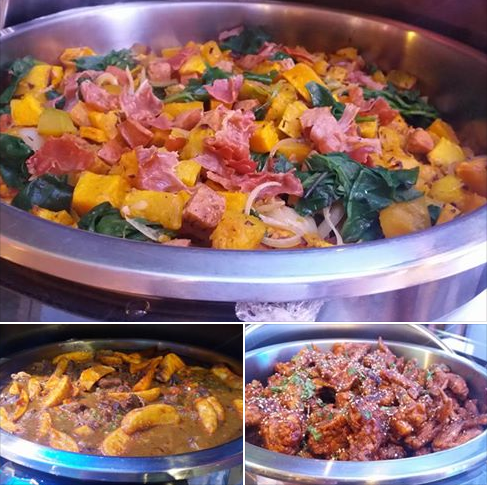 Twice in a month, you get to enjoy their lunch or dinner buffet without breaking the bank. The acoustic band started serenading guests at 7PM as I started off with appetizers. I had Crispy Chicken Skin, Kwek-Kwek and Bopis. The Bopis is made of pig's lungs and heart, cooked with tomatoes, onions,and chilies. It the best I've tasted in town. It had the right mix of spiciness and sourness. Everything was just right with all the flavors coming to life. Terraz's take on Paella is a revelation. 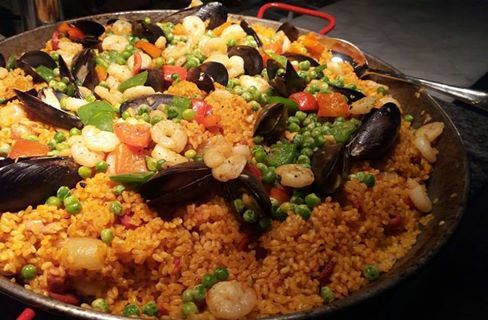 This well-executed dish seafood paella looks stunning with tiger shrimps, squids, and mussels. It was moist and flavorsome! Their buffet includes Maki sushi, vegetable rolls and california rolls. 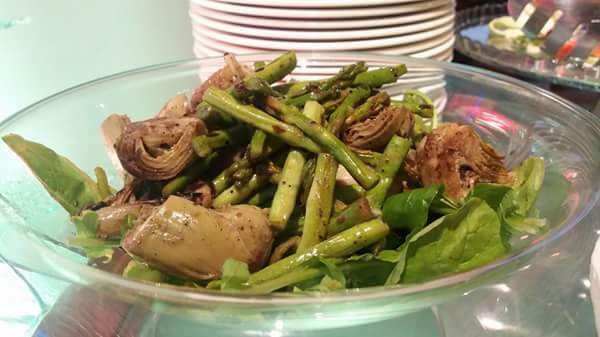 Their salad station shines the spotlight on garden-fresh veggies, and cold pasta dishes which you may combine with your choice of drizzled dressings. They also have Coffee Jelly, fruits, plus a handful of "kakanin" to satisfy your sweet cravings. 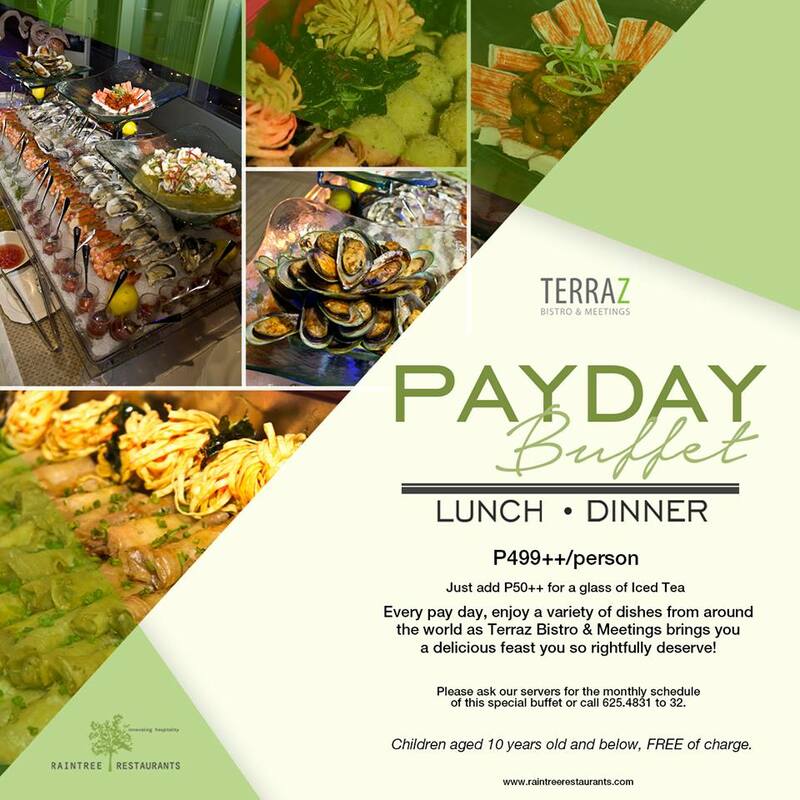 The Payday Buffet of Terraz Meetings and Bistro's wide variety of dishes allows you to have more of your food favorites. 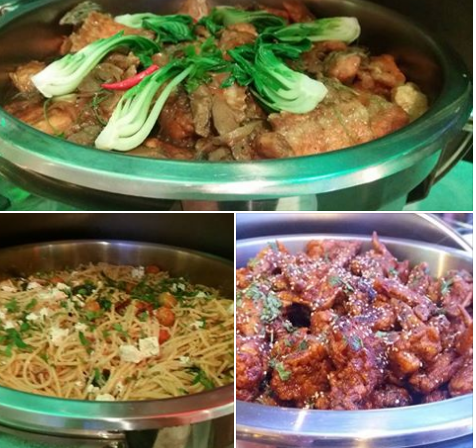 Since large groups and families prefer buffets these days, their dishes in the medium spread buffet line up works out great for you. Their menu line up choices varies every payday and get you acquainted to new ones. It is held only every 15th and 30th of every month. Should these days fall on a weekend or non-working holiday, then it is made available the succeeding workday for either lunch or dinner at P 499 ++ per head. Call 625-4831 to 32 For reservations and prior bookings.